Buy 2 Baker's Dozen for home or for work, 28 cookies. Great to freeze and pull when you are having a Blue Chip Craving or super gift to send to an office! 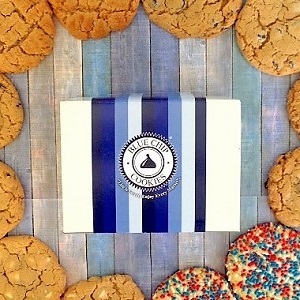 One flavor comes in our Blue Chip Signature Box, the other box wrap you choose. Buy 2 and save $10.00. Order by 2:00 pm EST Monday-Wednesday, we will ship that day if possible. We will ship Thursday for Friday/Saturday delivery only. If Thursday ship is not available, please feel free to call us and we will try to accomodate.